The film, “Demons in Paradise” produced by Jude Ratnam was scheduled to be shown at the International Film Festival in Jaffana but at the last moment it was announced that the film will not be shown at the festival. Malaka Devapriya with the intention of protesting against this act he had decided to withdraw his film ‘Bahuchithawadiya'(The Undecided) from the film festival. He had said that he will protest against banning of his own creations as well as creations created by any artists. He further added, he has different opinions against the film of Jude Ratnam, but still he is against the banning of such creation of an artist. 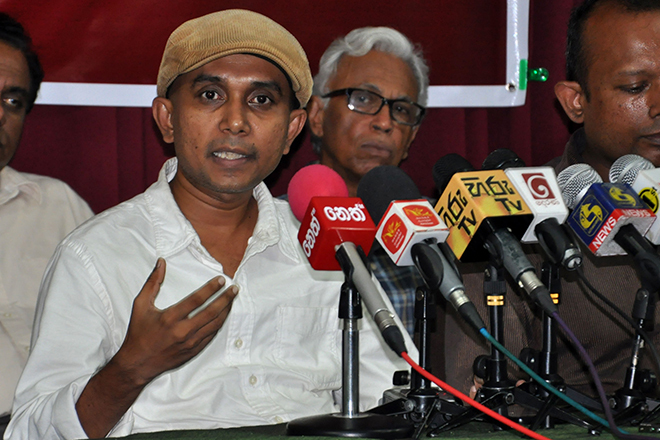 He said, he respects the courageous act taken by the organizers of the Jaffna International Film Festival for the continuity of the event and he stressed that his decision of withdrawing his film from the festival is to show his protest against the organizing committee. ‘Bahuchithawadiya’ which was the first film of Malaka Devapriya was scheduled to be shown at the Majestic Sineflex Theater at 6.45 pm today (6), representing the Jaffna International Film Festival.